Today the final planning application for proposed new £500m stadium for Chelsea FC is being discussed. If approved, it will be then up to London mayor Sadiq Khan to give the final green light and construction can begin. Back in 2012 Chelsea FC favoured building on the Battersea Power Station site but there was not enough space and plans were rejected. Now the existing ground will be demolished and the new stadium built in its place. This will also mean demolishing some homes but the investors will build new housing elsewhere locally to compensate for this. The new stadium is already a few months behind schedule and eagerly anticipated by fans. 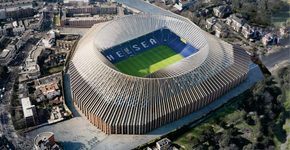 They prefer this development of the current Stamford Bridge site, increasing the capacity to 60,000 from its current 42,000 maximum – making it the 4th largest Premier League football stadium. During the 4-year redevelopment of the stadium will mean 1,000 jobs construction jobs and eventually the new stadium will mean 120+ full-time-jobs. The new stadium will be a great asset for Hammersmith & Fulham and it is widely anticipated that Chelsea FC should get the nod now on the amended plans. Work on the stadium could begin later this year with the Club needing to groundshare for the 2017/18 season and perhaps the following season too. The images of the new stadium plus the updated 3D Model animation below are from Swiss Architects, Herzog & de Meuron, designers of the iconic Bird’s Nest Stadium in Beijing. 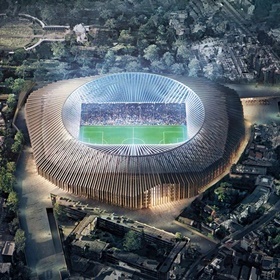 As predicted, Chelsea’s new Stamford Bridge stadium plans have been approved and will have a capacity of 60,000 + new walkway from the nearby Fulham Broadway Tube station. Just needs the Mayor of London’s approval now which won’t be a problem.